Agents and end users can send each other attachments through tickets. For more information about how to send an attachment as an agent, see Adding attachments to ticket comments. 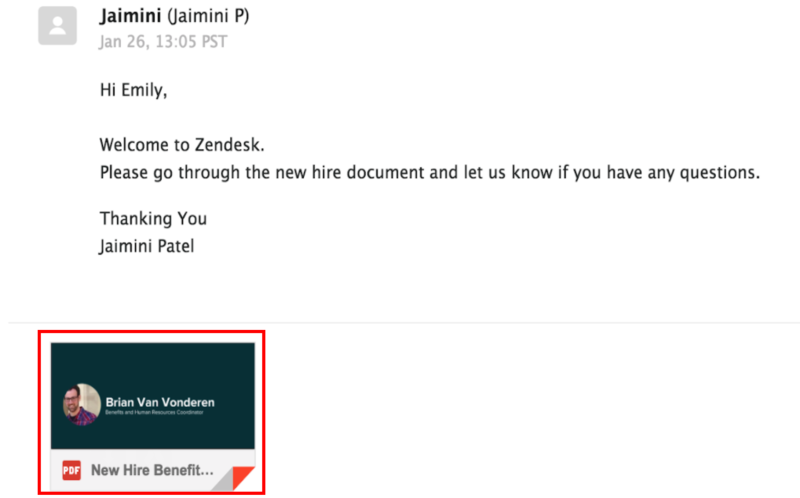 Zendesk Support accepts attachments from users sent in via the API, email, web form, and Web Widget channels in your Help Center. Users cannot send attachments through social media channels. Administrators can configure how attachments are handled in a number of ways, including setting privacy rules, end user permissions, and attachment methods. Note that attachments are not indexed by search engines unless the link for the attachment itself has been published in a Help Center article or something similar. This is the case whether Require authentication to download is on or off. Agents and end users can add attachments when creating or updating a ticket, or replying to an email notification. The attachments become linked attachments, which are links to external files that can be used to download the attachments, if and when they’re needed. This is the default behavior for attachments sent by email and this is what happens when email attachments are not enabled. If email attachments are enabled, the behavior is different. Agents and end users can send email attachments instead of linked attachments. Email notifications caused by creating or updating a ticket, or replying to an email, include actual attachments, instead of links to attachments. Email attachments appear as images and are a preview of the first page of the file. Inline attachment: You can drag and drop files into the body of an email or comment. The image of the file appears wherever you dropped the file. Appended attachment: Attachments that appear at the bottom of a comment and that send as part of the comment's email notification. Email attachments are enabled by the administrator using the Include attachments in emails option. This option is disabled by default. 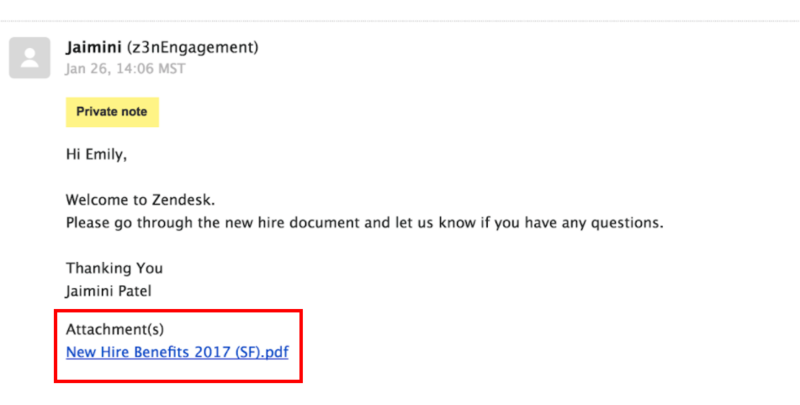 When email attachment file size limitations are exceeded, links to attachments appears in email notifications instead (see Attachment size limitations). The default attachment configuration allows your agents to add files to ticket comments and email notifications as links. You can allow agents (and end users, if given permission) to attach files directly to the comment. Click the Admin icon ( ) in the sidebar, then select Settings > Tickets. Under the Settings tab, select Include attachments in emails. Note: Include attachments in emails does not appear and cannot be enabled if Require authentication to download is enabled. At the bottom of the page, click Save tab. Once enabled, when an agent attaches a file to a comment, it is included as an attachment rather than a link. Note: Only files attached to the current ticket comment are included in the email notification. Files attached to earlier ticket comments are not attached to later email notifications. You can allow end users to send attachments when filing a ticket, or responding to an email notification. The permissions granted to agents, described in Enabling email attachments, apply to end users when configured. Next to Attachments, select the Customer can attach files check box. If you have Guide activated, you can make attachments private so that users need to be logged in to view shared file links in tickets or email notifications. If you don't make attachments private, the shared file link can be viewed by anyone. Important: If you enable private attachments, it will also disable inline images for users who are not signed in. If sensitive documents are attached to your tickets, especially identification documents such as passports and driver's licenses that can be used for identity theft, we recommend that you enable private attachments. Private attachments are enabled by turning on the Require authentication to download option (off by default). If you decide to leave this option off and an email notification is misdirected to someone other than an end user, sensitive information may be accidentally exposed to non-users. For example, the non-user might decide to click the shared file link in the email and then the attachment displays. Private attachments can only be used if Guide is activated. If Guide isn't activated, Require authentication to download prevents end users from downloading attachments since they cannot be authenticated. Unless Require authentication to download is associated with a specific group or agent, attachments are visible to any authenticated user. Once an attachment is associated with a ticket or post, visibility is restricted to users with access to the ticket or post that has the authentication to download. Attachments are not indexed by search engines unless the link for the attachment itself has been published in a Help Center article or something similar. This is the case whether Require authentication to download is enabled or not. Next to Attachments, select the Require authentication to download check box. Note: Include attachments in emails does not appear and cannot be enabled if Require authentication to download is enabled. Additionally, when you enable Require authentication to download, agents will not be able to copy and paste images from their computer into ticket comments. There are file size limitations for attachments. Make sure that you understand how these limits affect whether an attachment can be delivered as an email attachment, or must be delivered as a linked attachment instead. The limits described in this section are about email attachments only and don’t apply to linked attachments. If your plan includes a higher ticket file attachment size (for example, Professional or Enterprise), don’t worry—you can still send links to attachments that exceed the limits mentioned here, up to the limit specific by your plan. Each attachment cannot exceed 7 MB. All attachments cannot exceed 10 MB. If you exceed these limits, the attachments are sent as linked attachments instead. Attachments from earlier comments are included in email notifications as linked attachments as well. If you add multiple attachments in a ticket response, they are prioritized based on the attachment type and size. Inline attachments take precedence over appended attachments when calculating these limits. Note that when inline attachments are sent as links, they still appear as images in the body of the email notification. The scenarios below describe how this works. Files A and B are included as email attachments. Inline attachment A is sent as an email attachment. Attachments B and C are included as file links, as they push the total email attachment file size over 10 MB. Attachment A is included as an email attachment. Attachment B is included as a file link, as it pushes the total email attachment file size over 10 MB. Attachment C is included as a real attachment, as it brings the total email attachment file size to 9 MB. All files attached via. email are scanned for harmful viruses before being sent in an email notification. If an attachment is found to include a virus, it is not included in the email notification. Instead, the recipient is sent an error message stating an attached file was not sent, and recommends they contact the original sender. The sender does not receive a notification when an attachment is not sent. The drag and drop functionality will not work if you enable the option to "require authentication to download" attachments. This option can be found under [Admin>Settings>Tickets] and is done for security reasons since we can't verify who the inline message gets sent to after the original requester or CCed party receives it. Our email ticket setting is set to attach file. We receive attachments fine in the helpcenter but when we reply with attached file less than 1mb, somehow the recipient receives the email without the attachment. It's not the email client stripping the attachment though, is there somewhere else I need to look to fix this? In outgoing messages to your customers, attachments are going to appear as links, not as traditional attachments. You'll also want to make sure that you have the proper placeholders in your notification triggers to ensure that the attachment information is being included. Hi Jessie, that worked well! Thanks for the quick reply. I cannot get this to work. I want to copy and paste a snagit image (not a saved file) into a ticket. The copy and paste doesn't work, it deons't let me drag and drop into zendesk new ticket creation either. don't see any "require authentication" setting so I assume it's not set. This is a showstopper for us being able to continue using zendesk. How do I take a screenshot which I created using snagit and drop into a zendeck ticket. Can I do this when creating a new ticket or responsding to an existing one? Adding an attachment to a ticket is a different issue from adding an in-line image to a ticket. Which are you trying to do? Is it possible if we use the word "attach" or "attachment", that we get a warning before sending the email that we did not include an attachment? Thank you. I know that there's an app that someone wrote, independent of Zendesk, that's available on Github. I don't have a link to it, but if you or someone else in your organization has the technical acumen, that might be worth looking into. If you do decide to go that route, just bear in mind that the app is not supported by Zendesk, so use it at your own risk. Is this a known issue? We need to protect our customers attachments but would also like to use in-line images in tickets. At this time, we experience exactly as worded here. This is definitely known, but I do not believe this is considered an issue at this time. This is done for security reasons as mentioned so it will not currently be possible to add inline messages with these settings enabled. It sounds like you are looking for the ability to pick and choose who these settings are applied to, and while this is not current functionality it is definitely something that you could consider submitting as Product Feedback. Thank you for reaching out to Zendesk with your inquiry! An "Active Guide" is when you have an active Help Center is that accessible by your end-users. Guide is one of the many products Zendesk offers, and within your Zendesk you can see this by navigating to the four dots in the upper righthand corner of your Support instance (which symbolizes your product tray) and clicking on the Guide product. From here, this will take you to a page where you can see if this is an active product a part of your Zendesk, that is also viewable for your end-users. If your Help Center is active, you should be able to navigate to Admin > Settings > Tickets > Attachments, and select the "Require authentication to download". If you cannot see this option, it means that you do not currently use Guide or it is deactivated. Please let us know if you have further questions or concerns! I'm trying to add image to my reply to a ticket but it's only working as an attachment and not as in line with the text. Glad to hear you got it working! It does sometimes take a little while for new settings to sync and begin working. Also, I see that these are your first posts, so welcome to the Zendesk Community! Let us know if there are any other questions we can help you with. What is the maximum file size(s) for using the link when attachments are over 10MB? With the change to allow the actual files being attached, is there a way to delete the attachment if neccesary? Hope that helps! Please let me know if you have further questions. No, this change did not effect removal of attachments. I am wondering if it is possible to change the word " Attachments" in the help center or is it possible to edit the test from "Add file or drop files here" , I need to include instructions about the type of attachments we require. Hey Community, Loving the way we can attach files 'from ticket' in side conversations. How do we get that added to the main ticket window? Just make sure that I'm understanding you correctly, are you saying that you want to be able to re-attach a ticket attachment to a comment in the same ticket where the attachment already exists? I keep seeing that the max size for EACH attachment on the professional plan is 20 MB, but what is the maximum for ALL attachments? Is there a max number of attachments that a ticket can be submitted with, or a max total file size? I'm referring to end-users submitting through the contact form, to clarify. We don't have a listed known maximum for ticket attachment size total. I have personally never seen any user reach this. If you are having with all ticket attachments coming through, please feel free to reach out to support@zendesk.com so we can troubleshoot further. on an end user point of view, I'd like to add in the description part of the ticket, the images, so that I can describe properly the steps to reproduce the error I have, how can I do that ? We do not have a firm ETA on when this type of feature will become available in the Submit a Request form on Guide. If you are interested in seeing this feature get prioritized on our product roadmap, I would definitely suggest posting in our Guide Product Feedback Forum. Our developers look for customer recommendations for features to see how we will evolve the platform. The more requested/voted a feature is, the more they will work to add those features to future updates. Apparently it was marked as an area of product feedback about 3 months ago - I'm just wondering if there has been any progress on it. What is the maximum attachment size I can include in ticket comments?